Our Score Four series of transdisciplinary lessons and hands-on activities help teachers meet multiple curriculum requirements while inspiring environmentally savvy students. 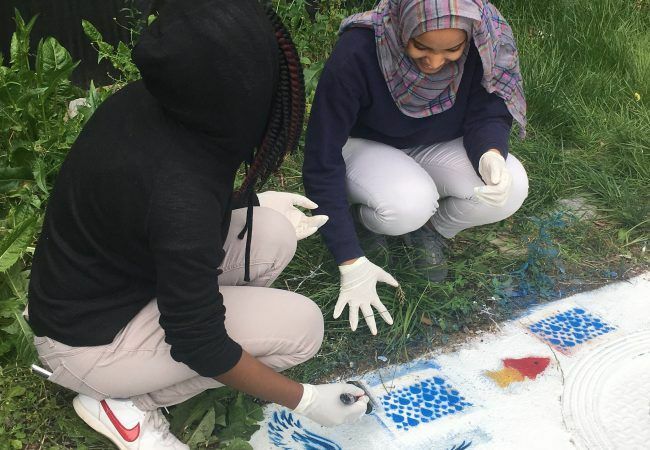 Using indoor and outdoor lessons and investigations, students assess factors that contribute to polluted stormwater runoff in their watershed and on their campus. They then plan and conduct an appropriate stormwater action project. Activities incorporate the scientific method, hydrological, biological and chemical processes, math, language skills, and analytical tools (such as tables, graphs, and maps). Geared towards high school students. Here we highlight a few schools that have participated in the program. Click on each school to see what they did! 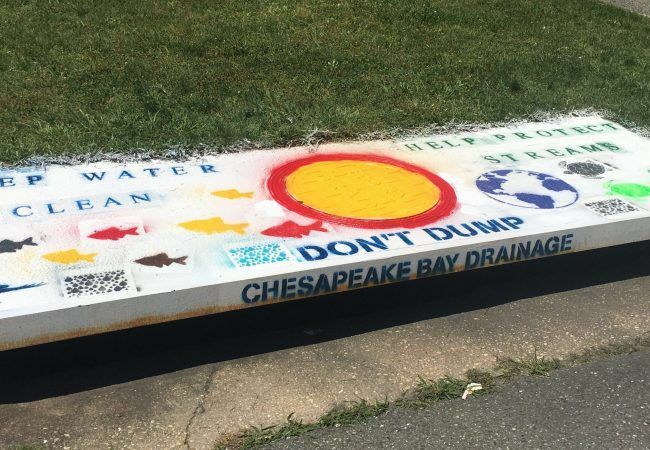 Science teacher, Laura Hernandez, and her students stenciled storm drains with phrases like, “Keep Water Clean” and “Help Protect Streams,” to remind everyone that what goes down the drain has a direct impact on water quality. 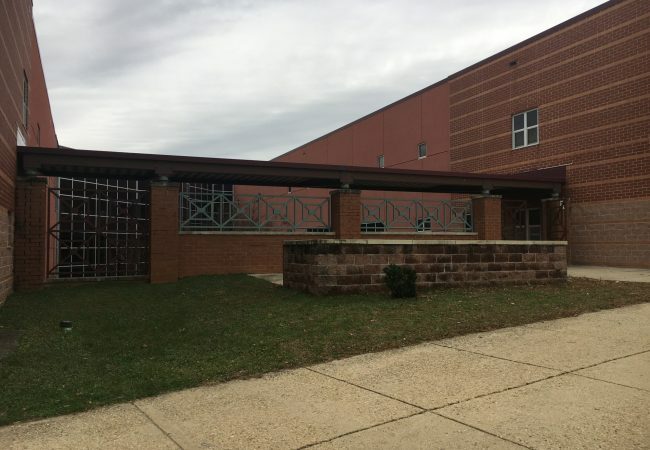 ?Beltsville, Md. 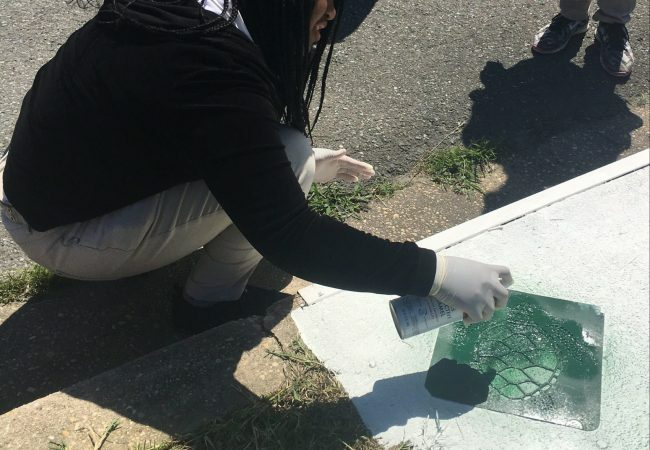 Students stencil raindrops to indicate that rain will carry pollutants and trash into the storm drains and out to streams and rivers. 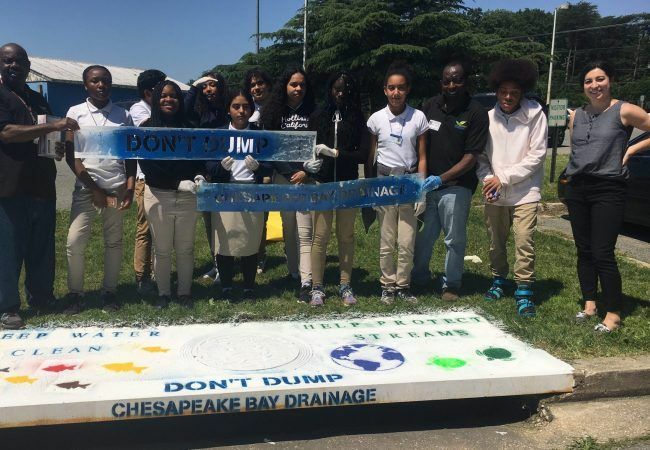 Science teacher, Laura Hernandez, with her students, as well as staff from Prince George's County Department of the Environment who came out to help. Students stencil pictures of turtles and other aquatic animals that can be harmed when pollutants enter waterways. 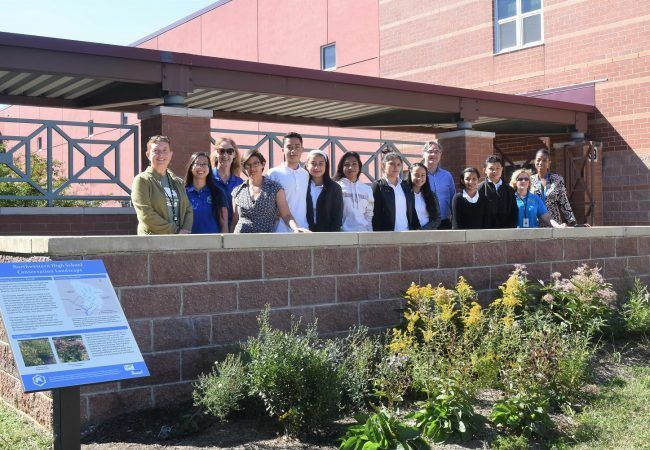 Kari Rowe, an English for Speakers of Other Languages (ESOL) teacher, and her students created two conservation landscapes in front of the school that not only beautify the campus, but also reduce stormwater runoff! 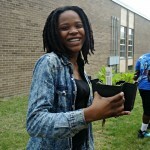 The gardens are so successful, that the school has requested Ms. Rowe and her students plant more gardens! ?Hyattsville, Md. Ramon Palencia-Calvo, Chispa Maryland, assists on planting day by showing students the proper way to plant. 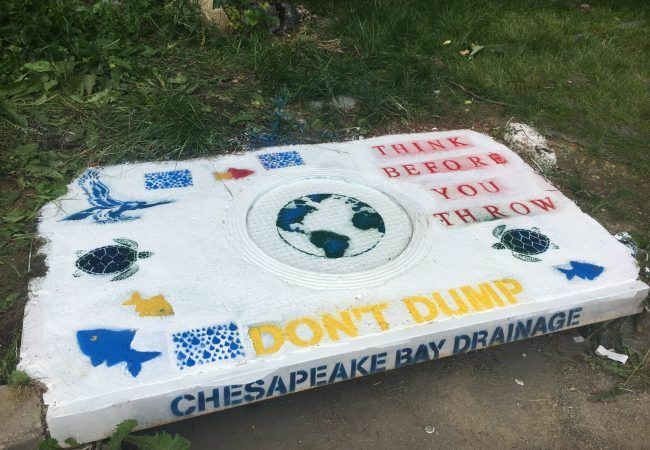 The final design for this conservation landscape was created by ICPRB staffer, Rebecca Wolf. Students chose this site for their conservation landscape. 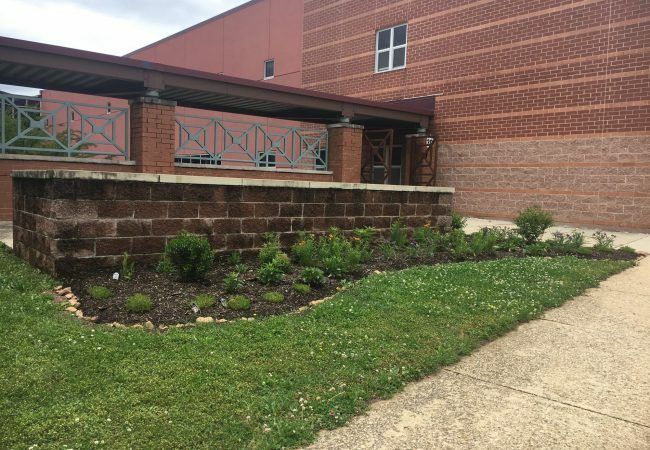 They decided that a garden in this space would reduce foot traffic, beautify the front of the school, and absorb runoff from the adjacent sidewalk. 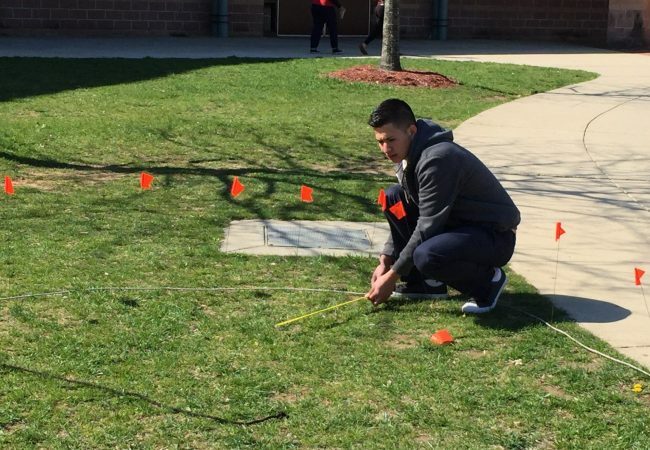 Students measure and mark the size and shape of the garden area. 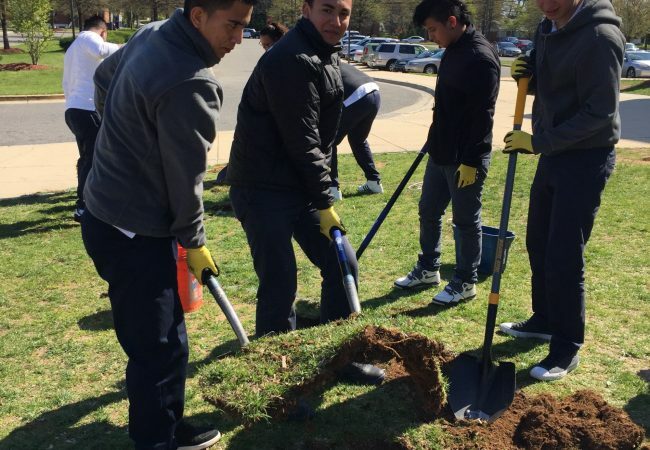 Students remove the top layer of grass which will be replanted in an area of erosion nearby. 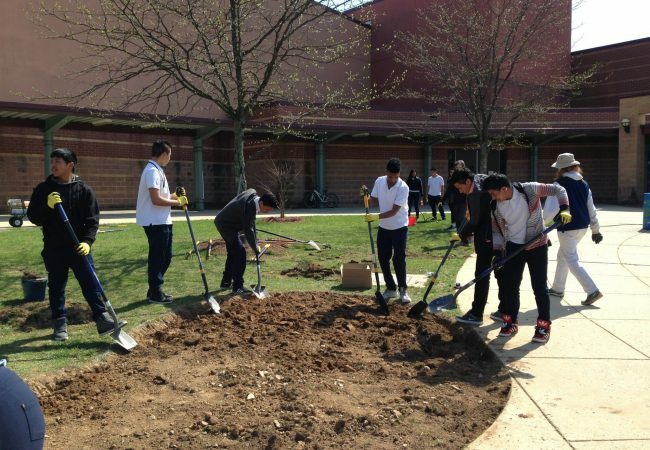 Students work together to prepare the site for planting. The garden after planting. 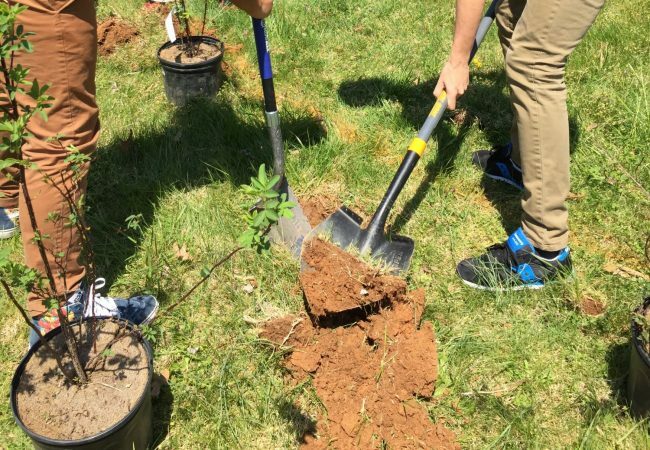 Students planted over 60 native plants and shrubs. 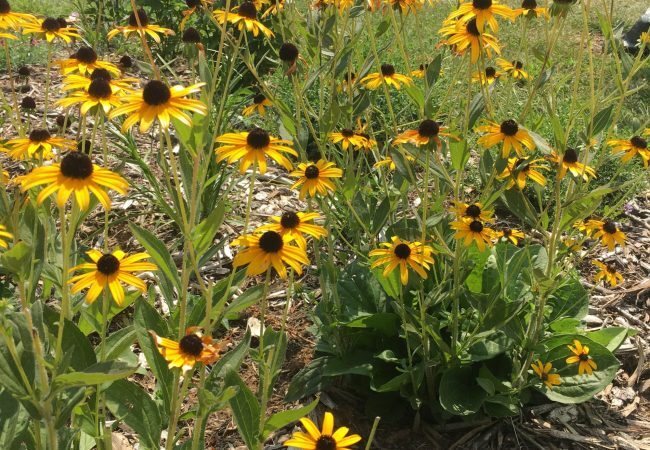 Students chose this native plant and Maryland State Flower, black-eyed Susan (Rudbeckia hirta), for its bright yellow flowers and ability to attract butterflies. 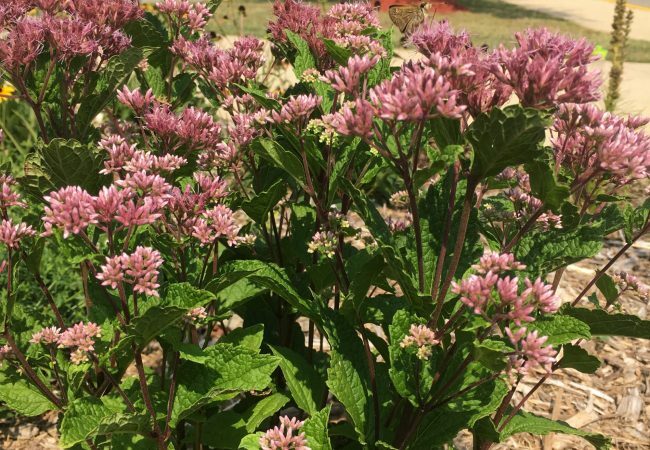 Students chose this native plant, Joe-pye weed (Eupatorium maculatum), for its tall height. The garden after 1 year. ESOL teacher, Kari Rowe, and some of her students celebrate their garden with several program partners. 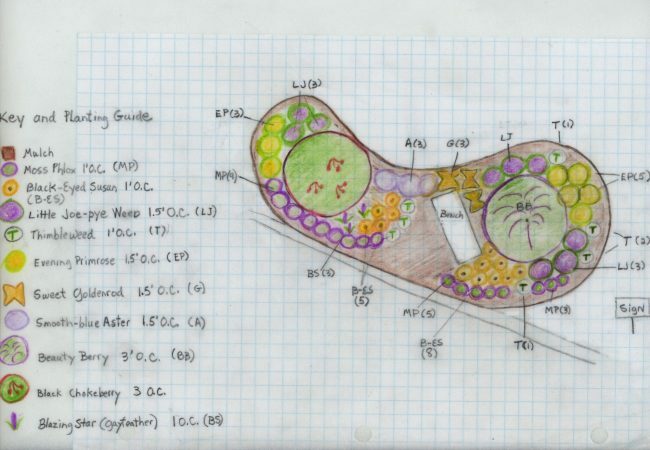 Using native plants chosen by the students and with designs created by the students, ICPRB staffer, Nguyen Le, created a final design for the conservation landscape. This is what the area looked like before. During a rain event, the rainwater will flow downslope to the left and flow into the drain. 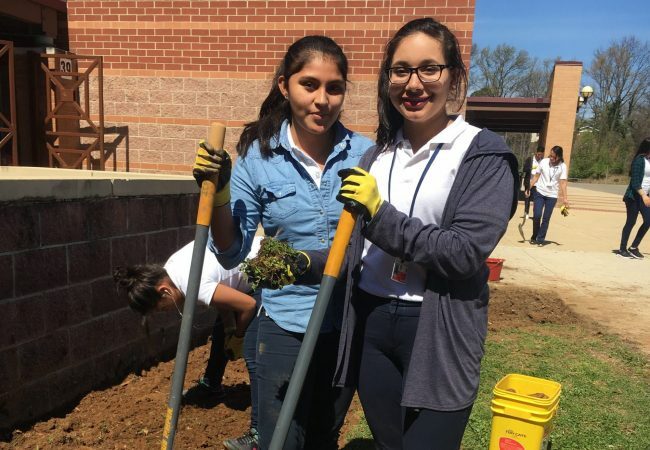 Students work to remove the top layer of grass and any remaining weeds from the garden area. 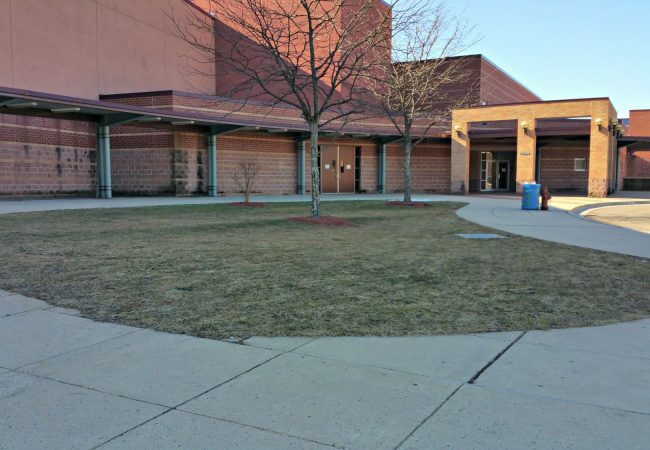 The grass that is removed is replanted in an area of erosion at another area on campus. 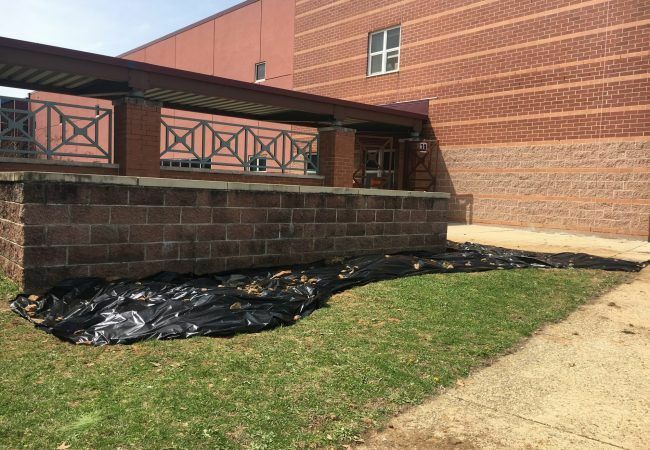 After removing the top layer of grass, the students placed black plastic over the garden area for 3 weeks to kill any weeds. 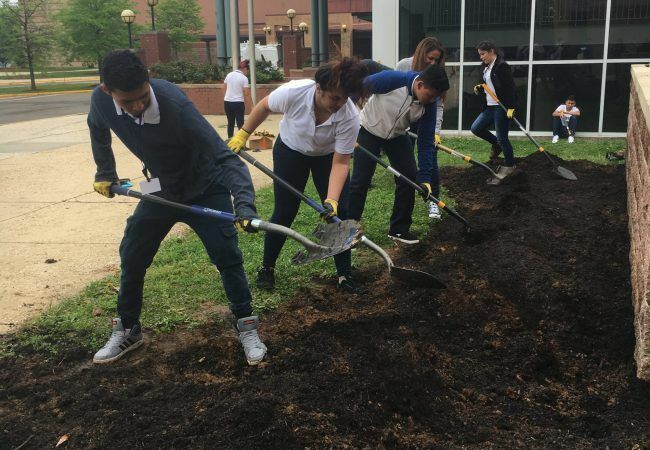 Students add organic compost to the garden area. Compost adds nutrients and beneficial microbes to the soil. 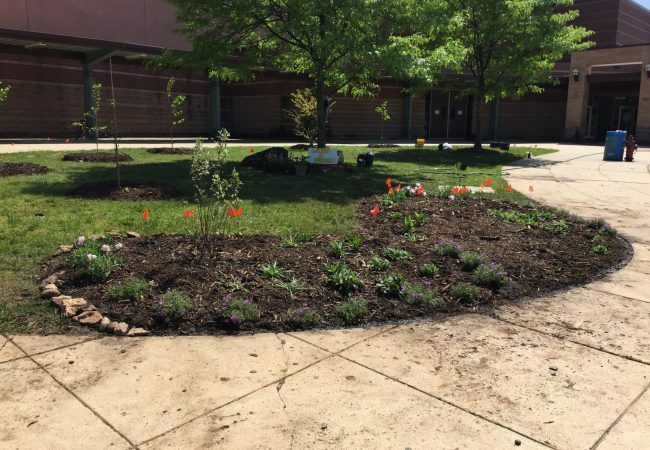 Students plant native plants that attract native butterflies, birds, and insects. 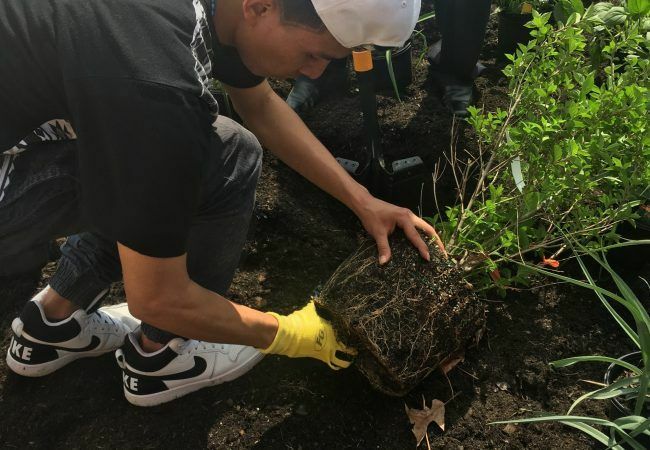 Students removed approximately 250 square feet of grass and planted 75 native plants and shrubs. 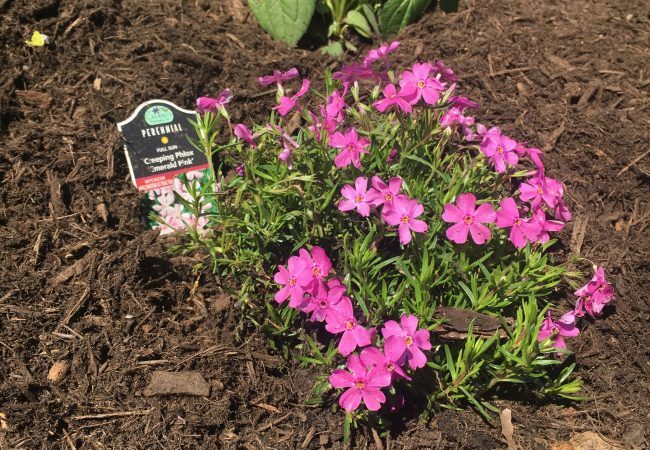 Students chose Phlox stolonifera, creeping phlox, for it's bright flowers and short height. The garden after 3 months. 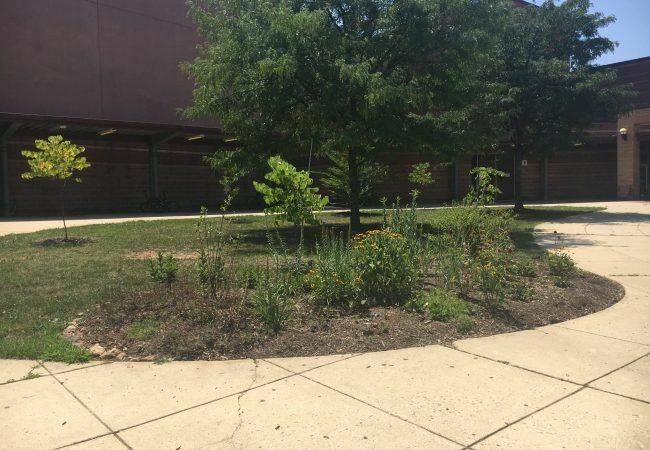 Science teacher, Malka Ostchega, and her students planted the beginnings of a food forest on their campus. The project site is on a steep slope with some areas of erosion that abuts the parking lot and nearby storm drains. 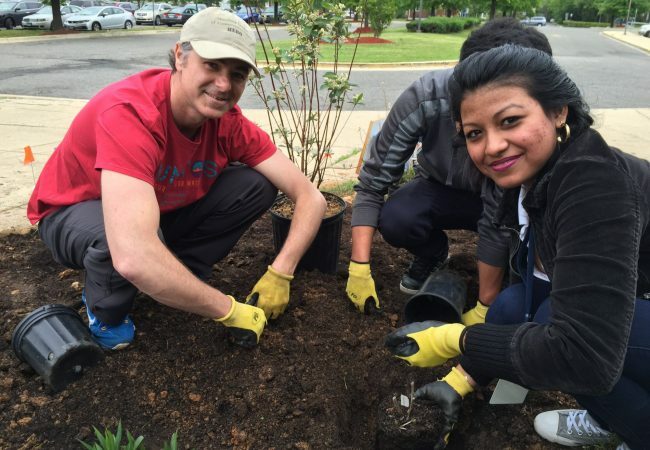 The trees and shrubs they planted will reduce runoff by improving soil porosity and infiltration. ?Riverdale, Md. 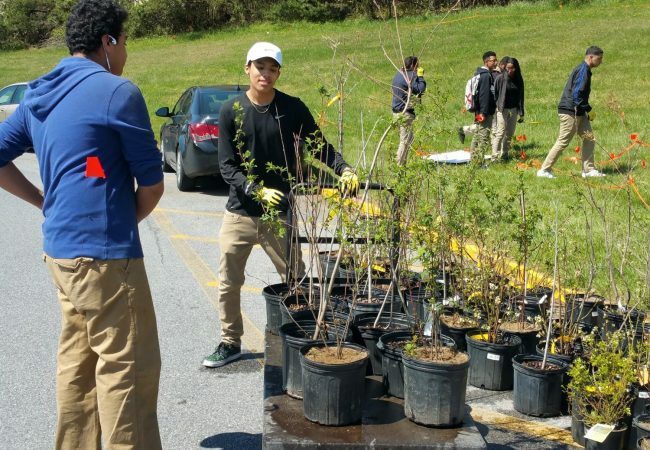 Students planted a total of 78 native trees and shrubs on a hill next to the school's parking lot. 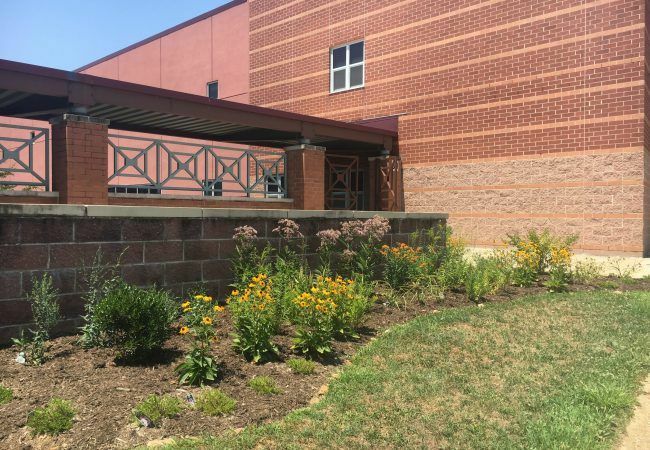 These plants will reduce the volume of stormwater runoff and sediment coming from the hill. 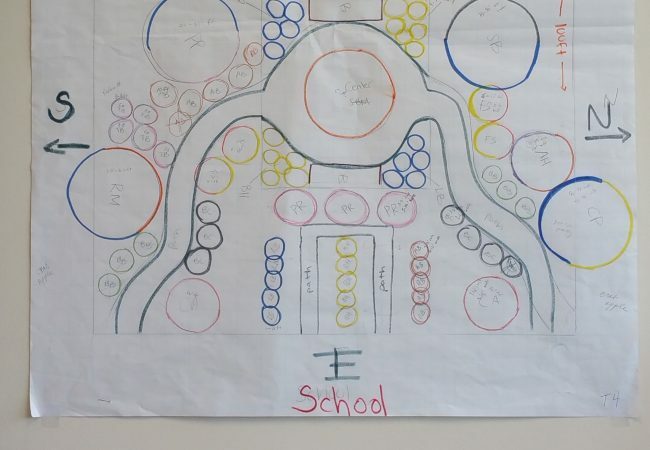 Students worked in teams to create designs for their food forest. 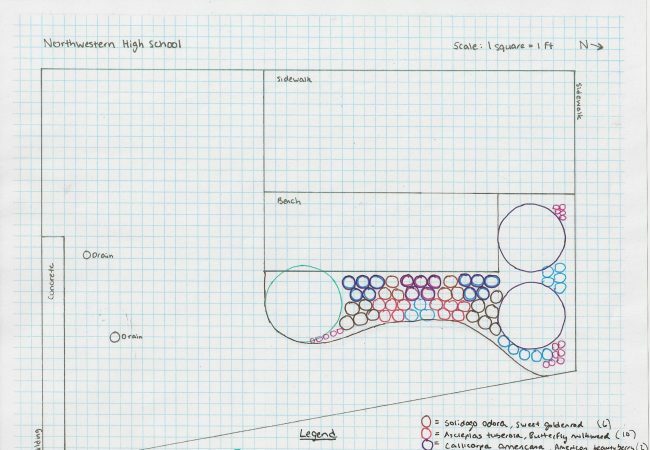 After presenting their designs and using a scoring rubric, the highest scoring designs were selected for the Design Contest. This was the winning design, which was then edited based on plant availability, spacing, etc. The winning team with the finalized food forest design. 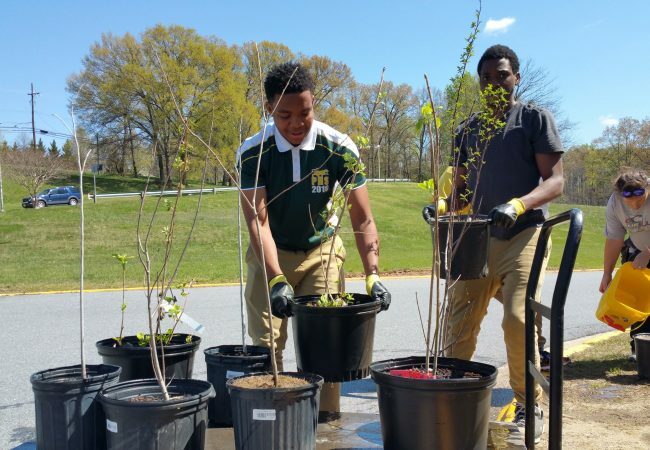 During plant selection, students researched edible fruit trees and shrubs to plant in their food forest. Some native trees and shrubs include lowbush blueberry (Vaccinium angustifolium) and American crabapple (Malus coronaria). It took a lot of effort to dig through all that clay soil! 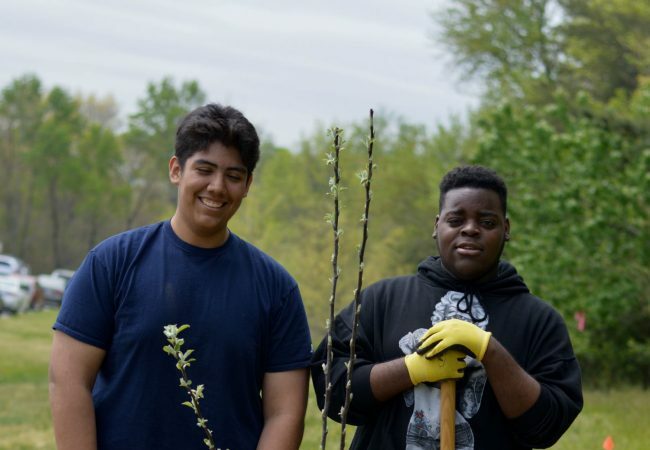 The food forest covers 10,750 square feet on a turf-covered hill with eroded areas. 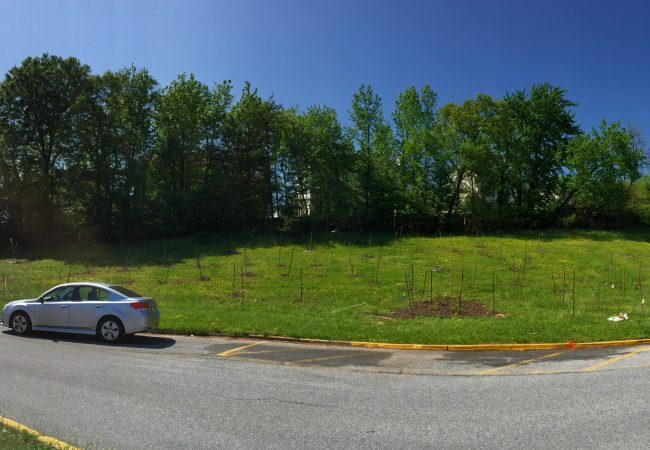 The trees and bushes will reduce the volume of stormwater runoff and sediment coming from the hill. 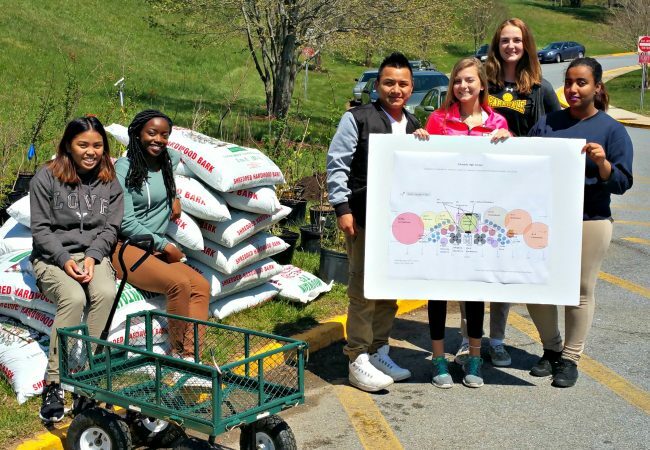 Watch the video below to hear what students thought about their Score Four Student Stormwater Action Project.